She was born Princess Charlotte of Belgium but became famous the world over as Carlota, Empress of Mexico. From her earliest childhood she displayed the characteristics she would be known for throughout most of her life. She was extremely hardworking, despised idleness, very driven, very intelligent, very courageous and very independent while also being very devoted to those she loved. On July 27, 1857 she married Archduke Maximilian von Hapsburg, younger brother of Emperor Francis Joseph of Austria. For a time they were the viceregal couple of the Austrian territory in Italy but found their hands tied there and unable to have much of an impact. When the French Empire and leading Mexican Catholics offered Maximilian the Crown of Mexico she urged her husband to accept. They were both young and idealistic and convinced they could make Mexico great and usher in a new era of monarchial glory in the New World. Going by the Spanish version of her name, Empress Carlota quickly showed her hardworking nature and zeal to be a good empress. She held parties to raise money for the poor of Mexico, hand sewed nightshirts for people in the hospital and had orphanages and poor houses built. She also proved a more able administrator than her husband and often acted quite capably as regent while he was touring the country. She was also extremely brave and afraid of nothing. When republican revolutionaries became a problem she assured her husband that there was no situation she could not handle. She told him that if a threat arose, as long as she had a few hundred zouaves on hand she could deal with it herself. Although she was a proud relative of the old French Royal Family she, like many others, became infuriated by French actions and when it was announced they would remove their troops from Mexico, in violation of the Treaty of Miramar, she went to Europe to confront Napoleon III herself. Sadly she did not see Mexico or her beloved husband again. 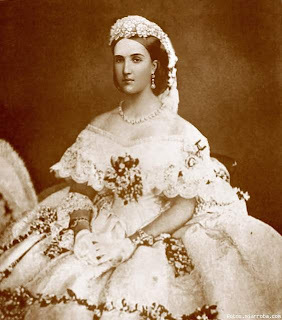 She soon fell into a worsening state of insanity and as her husband marched to his death at Queretaro she had a complete breakdown in Rome while visiting Pope Pius IX. She spent the rest of her long life in seclusion in Belgium. She lived through the First World War and German troops were posted to guard her estate warning potential troublemakers that it was the property of the Empress of Mexico, the sister-in-law of their ally the Austrian Kaiser. She died in January of 1927 and her coffin was escorted by the few elderly survivors of the Belgian Legion, the Empress Carlota Guards, who had fought for her in Mexico. Thank you for this tribute to Empress Carlota. Hers was a tragic story, indeed. I welcome your article on Empress Carlota. Thank you very much. I adore Carlota, she was a beauty, she was strength, she was intelligence and she had zeal like most couldn't believe at first sight. The sturdy work ethic of Belgium and the glamor of France -that was Carlota. She was also a good, adoring wife to her husband even though many thought she was the stronger of the two. Thank you very much for this post. I tend to concentrate on British and Russian royal history so I didn't know much about Carlota. She certainly sounds like a very admirable woman. It's refreshing to hear this nice account rather than the mocking ones written over and over. However, I was just finishing again "The Last French Queen", a biography of Marie-Amelie, another model wife of a not-so-great ruler, Louis Philippe, cough cough "The Citizen King". Carlota was the daughter of her favorite daughter Louise. When Carlota and Maximilian visited Marie-Amelie in England to seek her blessing before embarking on their tragic Mexican expedition, almost clairvoyantly, the pious former Queen warned them outright "You will both be murdered". Maximilian was her grandnephew and had tears in his eyes, but was undeterred. Only when the royal pair arrived in Mexico did they begin to realize how challenging the situation truly was. Even to get from the port to Mexico City in impossible travel conditions nearly daunted the indefatigable Carlota, as she wrote in a letter. It's unpleasant to remember that it was the US covert support to benito Juarez that did in the monarchy. Thanks, I had heard that before and she was not the only one who foresaw a bad future for Max and Carla. Sadly it was largely the US that doomed the whole enterprise. Even if Max had pulled off a miracle at Queretaro and won the US stood ready to invade Mexico to ensure the monarchy's destruction. Personally, I think more than just devout republicanism it was due to the US wanting Mexico to remain as it had been and as it is today: chaotic, crime-ridden, divided and thus not a threat. Carlota, or Charlotte, to me is a figure that has been misunderstood and misrepresented by history for years. Having written a screenplay on her that is about to be produced, I read every single biography on Carlota available. I also had the amazing privilege to read the original letters she wrote to her brother Philippe at the archives of the royal palace in Brussels. Reading and touching those letters was an amazing experience, but above all, it made me realize this woman was not mad at all. In her so called 'mad period' at Miramar, she complaint to Philippe that she was writing so many letters to so many people, but that no one ever responded to them. Reading those letters made me realize this wasn't just a historical figure but a real person, with real feelings.